The newly installed 3D mammography unit at Monongahela Valley Hospital (MVH) helps in making it easier to find even the smallest cancers earlier with greater accuracy. The new unit is the same technology used at HealthPlex Imaging, allowing MVH to provide another location to offer this breakthrough technology. Monongahela Valley Hospital (MVH) is continuing the fight against breast cancer with innovative technology designed to overcome barriers to detection. MVH has installed a new 3D mammography unit, the same technology used at HealthPlex Imaging, making it easier to find even the smallest cancers earlier with greater accuracy. "We are thrilled to offer this breakthrough technology at HealthPlex Imaging and now at the hospital," said Louis J. Panza Jr., President and CEO of Monongahela Valley Hospital. "When breast cancer is found early, the chances of survival are greatly improved. The newly installed machine provides quality images and enhances the patient experience to make early detection possible." Compression is key to getting an accurate mammogram. However, the associated discomfort and pain are key reasons why women avoid mammography exams. The system's personalized compression helps women overcome any fear they might have because the new technology exam has been proven to be more comfortable. "It's important to us to remove any barrier that could stop a woman from getting the screening she needs," said Jan Forlini, director of Imaging Services at MVH. "With this machine, each woman gets exactly the right amount of compression for her breast type. The force is automatically adjusted for the greatest individual comfort without losing any accuracy." 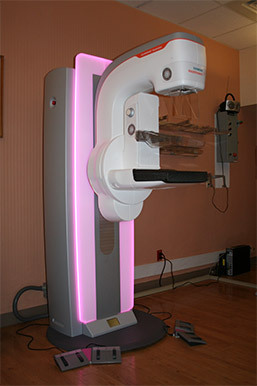 MAMMOMAT Revelation is the next generation of 3D mammography (breast tomosynthesis). Its unique, wide 50-degree angle, the industry's highest depth resolution, captures more detail for extremely high-quality 3D images that increase diagnostic confidence and enable earlier detection of even subtle lesions. MVH's new unit is also the first mammography platform to provide automated breast density measurements at the point of examination. High breast density can increase the risk of developing cancer. Currently, breast density is estimated visually during the image reading process, usually after the patient leaves. Now, having the ability to obtain this information during the exam enables immediate and personalized risk assessment, and allows MVH to provide supplemental imaging while the patient is having the exam. Mammograms can be scheduled at both MVH and HealthPlex Imaging; walk-ins are also welcome. HealthPlex Imaging is open late until 8 p.m. on Tuesday as well as Saturday mornings from 7 a.m. to noon. For more information, visit the Medical Imaging page on the Monongahela Valley Hospital Web site.